Hot links: How do I install Simplewall? 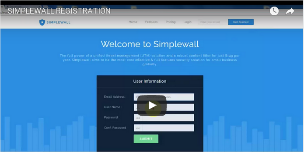 How do I register for a Simplewall account? How do I request support from Simplewall? What is Simplewall Data protocol report and where can I find it? What is Simplewall User Data report and where can I find it? What reports are included in Simplewall Content Filter Report? What is Simplewall alert & what type of alerts are included here? How do I check SImplewall URL Usage Reports? Share your questions via messages or posts. Browse our video tutorials to see how every feature works.